In 1908, Japanese chemist Kikunae Ikeda isolated and patented monosodium glutamate, more commonly known to English-speakers of the 21st century as the often-maligned MSG. Ikeda thought that his discovery was so special that the taste deserved to be described with a brand new word, a word that a century later has become quite popular among food critics and even graces the signs of a burger chain here in Southern California. Ikeda's word was umami. Umami — inspired by a commonly used Japanese word meaning "tasty" — was the taste of the future. With its seemingly magical (and all-natural) properties that allowed it to enhance the flavor of any dish, MSG was the epitome of modern dining. Umami was that meaty, savory, hard-to-describe flavor that needed a new word for a new age. 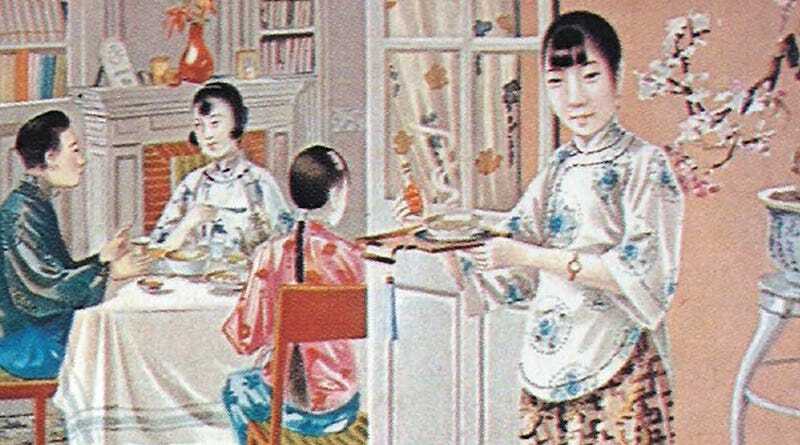 By 1909, MSG was being marketed in Japan under the brand name Ajinomoto, and quickly spread to China and the United States in the following decades. Ajinomoto began building its domestic market in the ﬁnal years of the Meiji era (1868–1912), when Japan was rapidly developing its industries to join the club of the Western powers. Educated Japanese of the era invested great faith in the beneﬁts of modern science. As business historian Louisa Rubinﬁen has noted, Ajinomoto offered “predictability, efﬁciency, convenience, and scientiﬁc guarantees of hygiene and nutrition—attributes consonant with the Meiji-period goals of ‘civilization and enlightenment.'" American food companies started using MSG in the 1930s as an inexpensive taste-enhancer, and after World War II it was in a large number of food products in the United States. According to historian Ian Mosby, in 1969 there were about 58 million pounds of MSG being produced per year in the U.S., and it showed up in products as diverse as "breakfast cereal, TV dinners, frozen vegetables, condiments, baby food and canned soup." It was especially popular as a vegetarian option for adding meaty flavor to meatless dishes. But it wasn't until mainstream America became acquainted with Chinese restaurants in the late 1960s that anybody took issue with MSG and started reporting ill effects. The "Chinese Restaurant Syndrome," as it came to be known, was identified by wildly diverse symptoms, including everything from headaches to heart palpitations. The "syndrome" was first studied seriously in 1969, and the press quickly pounced on MSG as a stomach-crippling foreign invader. Needless to say, most of the aversion to MSG could be chalked up to simple unfamiliarity with a cuisine that was new to many Americans — along with a dose of simple old-fashioned racism. However, some of the most liberal estimates gleaned from reputable studies find that about 1-2% of the population could have an MSG sensitivity. MSG manufacturers lobbied intensely during the 1980s to get umami recognized as a fifth taste quality, along with sweet, bitter, salty and sour. Today, some research has identified it as its own distinct taste, though it's not universally accepted. Which brings us back to that restaurant chain, Umami Burger. It's a great joint and I can't recommend it highly enough, but I can't help but laugh when I see their signs around town. Despite the overwhelming evidence that MSG has been unfairly maligned, like gluten (which is fine for the vast majority of the population that's not allergic to it), I'm not sure many Americans would line up to eat at a place called MSG Burger.